We spent last Saturday at the Grand Canyon with Mrs & Mr G. Thanks guys for hosting us and it was fun. As I had mentioned before SG was V’s great friend during their undergrad days and now that the G’s are in Phoenix, we made our trip there. Catching up and just taking things as it comes. 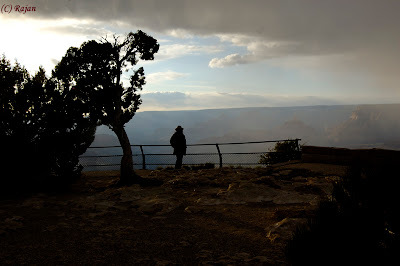 We ofcourse went to the Grand Canyon and the weather was not the best. Snow flurries and near freezing temperatures, but it was still amazing. It is something that can never be described. R has clicked some great photos and yes it will be loaded soon in his blog. Can you send those snow flurries and freezing temperatures to Chennai? We are getting roasted alive here.